Here's a little something I cooked up for you all. 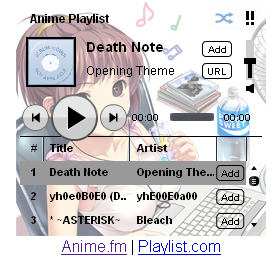 For some of you that might want to listen to anime music on your site or on, say your iGoogle dashboard, this little widget should help you out. Presenting the anime.fm iGoogle gadget ^_^. More updates to this gadget/widget will come down the road. Thanks once again to Playlist.com for the bulk of the coding on this one. Be sure to support them and of course you can also support me on anime.fm. Cool gadget. I am always looking for ways to add music to my iGoogle page. I have watched a little anime when I was younger.